Not knowing how much money you should bet and raise is a very common mistake among beginners. If you want to shift from being a beginner at No-Limit Texas Holdem to a skilled poker player, you have to learn how to size your bets properly. You should think about the desired outcome of each of your actions first. You typically want to achieve one of three results when you place a bet. 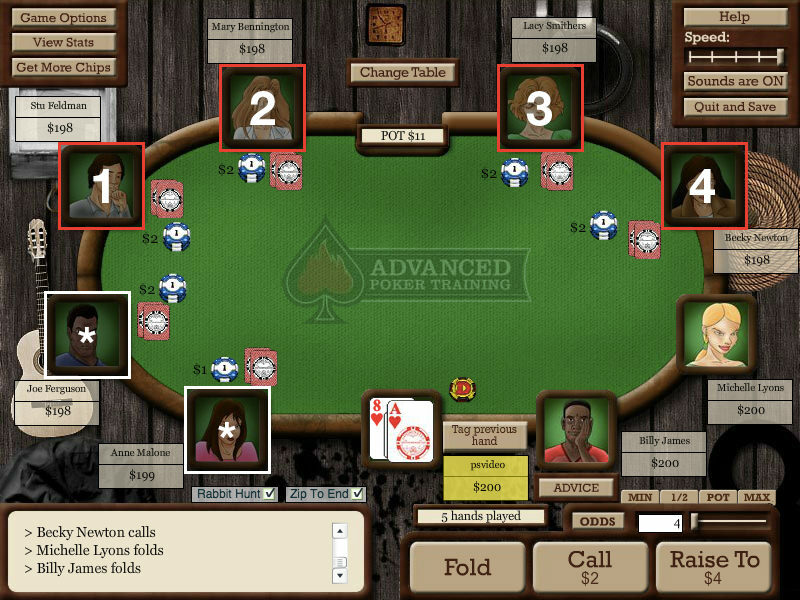 Reduce the number of opponents, increase the pot size or manipulate other players to fold to you. 1. Facing too many opponents in a raised pot can be dangerous. When more and more cards are revealed, even a mediocre hand such as pocket Two’s can beat a strong hand of pocket Aces if a third Two is revealed on the river. To avoid this danger you want to narrow down the number of players in a raised pot to two to less. It is much easier to play poker against fewer opponents. 2. The most common reason to bet or raise is when you have a good starting hand. If you believe you hold the strongest hand at the table, you want to get more money into the pot. In this scenario, correct bet-sizing is critical for making the highest possible profit. Betting too much can have the effect of everyone fold, instead of putting more chips into the pot. 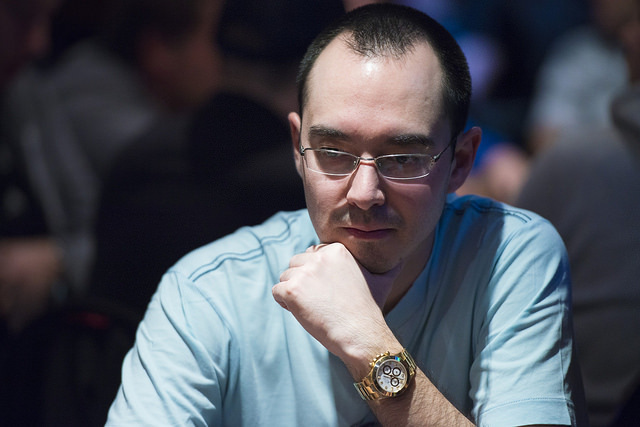 Betting too little can keep too many players in the pot. See 1. above. 3. You may want to announce to the table that you hold a strong hand. If you can play a mediocre hand in the same way as you would play a very strong hand, you can often trick your opponents into folding, even if they might have a better hands than you. You should avoid betting or raising the same amount of chips, regardless of the number of opponents who already entered the pot. A good rule of thumb is to raise three times the big blind, plus one big blind for every limper in the pot. (We don’t count forced bets in the small blind and big blind position.) This amount is often sufficient to narrow down the number of players. 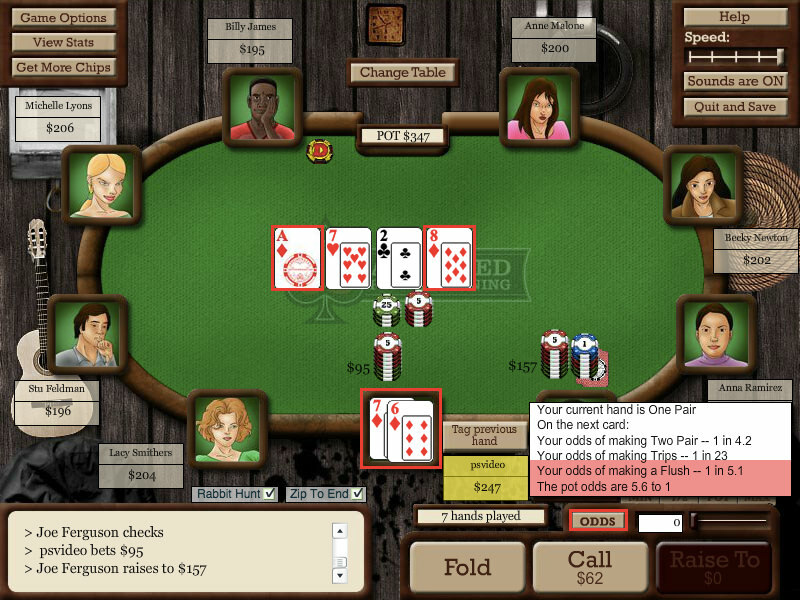 Example 1: A cash game of Texas No-Limit Holdem with nine players and a blind structure of $1/$2. Your default bet size should be three times the big blind: 3 x $2 = $6. If four people called the big blind (red frame and number), you could add another: 4 x $2 = $8. Your total bet would be $6 for your base bet + $8 for four limpers = $14 total. Some of the more experienced players choose to bet size of 2.5x the big blind instead of 3x. They believe it has the same effect while putting fewer chips at risk. Another beginner mistake is betting too much. An extreme example would be to have pocket Aces and then to go all-in before seeing the flop. Everybody might fold, and you could win the blinds, but you could have made a much higher profit by betting correctly. After all, you want to find a balance between narrowing down the number of players while increasing the pot size at the same time. You should take the behavior of other poker players at the table into consideration when determining your bet size. If your 3x or 2.5x betting formula does not accomplish your goal, you could try to increase your base bet size to 4 to 6 big blinds + 1 big blind per person. You should determine your post-flop bet based on the total number of chips in the pot. A good rule of thumb is to bet somewhere between 50% and 100% of the total number of chips in the pot. With this ratio, you can often get worse hands to call, better hands to fold. If the total number of chips in the pot is 50, you could bet between 25 to 50 chips. Let’s say the pot contained 20 chips. In this case, you could bet between 10 to 20 chips. You will face many post-flop situations where your opponent holds a drawing hand that could complete a straight or a flush. Your goal should be to increase their cost to draw high enough so that it exceeds their chance of completing a flush or a straight. Let’s say our opponent holds the king of hearts and 10 of hearts. The flop shows 2 of hearts, 7 of hearts, 9 of clubs. The odds of him hitting the flush on the turn are 38:9 / 4.22:1. If there is $400 in the pot and we bet $100 (25% of the pot) the pot would grow to $500. That means it would cost him $100 to have a chance of winning a pot of $500. How do we calculate his pot odds? We divide the pot size of $500 by the number of chips it would cost him to win the pot: $500/$100 = 5:1. His pot odds are 5 to 1 in this scenario. In example 4, the pot odds are 5:1 and the chance of completing his hand are 4.22:1. The pot odds are greater than the odds of completing his flush, so he should call. We could have avoided this scenario by changing the pot odds in our favor. If there is $400 in the pot and player we bet $300 (75% of the pot), the pot will grow to $700. That means it will cost him $300 to have a chance of winning a pot of $700. To calculate his pot odds, we divide the pot size of $700 by the number of chips it would cost him to win the pot: $700/$300 = 2.33:1. In example 5, the pot odds are 2.33:1 and the chance of completing his hand are 4.22:1. The pot odds are smaller than the chance of completing his flush, so he should fold. Even if your opponent got lucky, he would lose in the long run. You should not give away any predictable betting pattern in any stages of the game. Beginners often bet more with stronger hands and less with weaker hands. This behavior will be noticed by more experienced players and exploited immediately. To prevent predictability, you can either randomly vary the size of your bets or keep betting the same increment every time you bet. Randomly varying your bet size throws off your opponent and keeps them guessing. Keeping the same increments tries to archive the same goal. If you bet the same amount independently of if you have a strong hand or are bluffing, your bluffs will become more believable, and your opponents cannot pick up patterns in your play. For beginners, we recommend the second strategy of consistent bet increments. How can you practice bet-sizing? For additional practice, we recommend you to take a look at our advanced poker training software. Once you created your new account, navigate to the member page and click on 9-Max icon. You can practice against 100 life-like opponents and play up to 500 hands an hour, with no waiting for slow opponents. Whenever it is your turn, you determine if you have a playable hand or even a raising hand. See our article on starting hands for more details here. If you hold a strong hand in your hand, you can calculate the appropriate bet size with our formula. In our example, we play blinds of $1/$2. This gives us a base bet of three times the big blind of $2 = $6. Two additional players have limped (We don’t count the forced bets of the small blind and big blind position). Therefore we add two additional big blind to our total = $4. In this example, we hold a medium suited connector of 6 and 7 of diamond in our hand. The board shows two additional diamond cards ace and 8, which gives us 9 outs for a flush draw. During the game, we can click the “odds” button at any time to see the probabilities of various streets. We can see that our pot odds are 5.6:1, our chance of drawing a flush is 1 in 5.1 (editor’s note: which is actually 4.1:1 — this has been changed in the current version of the poker game so that the way the odds are expressed is consistent). The math is wrong on example #3 and the odds of him hitting a flush on the turn (not the river which is also a typo as there are 47 cards still unknown. If it were the river there would be 46) are not 23.69%. They are in fact 19.14% or 9 outs divided by 47 remaining cards. Apologies. You are correct about the error. It has been resolved.